CAREL, a leader in refrigeration and heating, as well as systems for humidification and evaporative cooling, recently held a groundbreaking ceremony to mark the expansion of its CAREL USA production plant in Manheim, Pennsylvania. The plant expansion, which will more than double the area devoted to production from 35,000 to 70,000 square feet, is part of a global geographic footprint expansion strategy, involving mainly the United States, Europe and China, serving the company’s organic growth for the coming years. CAREL expects to complete the expansion in by the end of 2019 first semester. 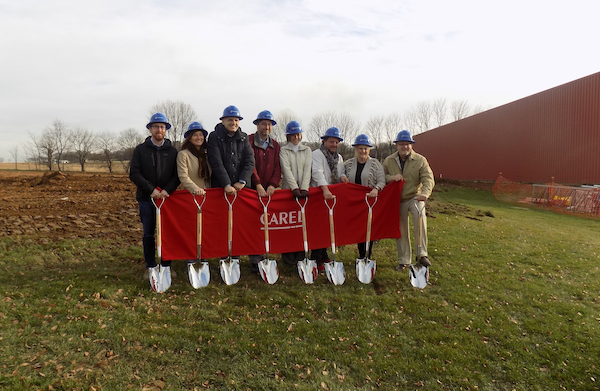 CAREL’s groundbreaking ceremony marked its plant expansion in Manheim, Pennsylvania. "The extension of the plant follows the implementation, in the same plant, of the first U.S. programmable controller production line, completed last summer, and shows the interest of the group in the North American market. We expect it to represent a significant accelerator for CAREL’s growth, which will be based on innovation, energy efficiency and customer care,” said Francesco Nalini, the Group’s Chief Executive Officer. According to Nalini, expanding production capacity in the United States allows CAREL to be closer to its customers and meet their needs more promptly and effectively; moreover, it will be a fundamental step in increasing market share in the country, avoiding bottlenecks and improving logistics. CAREL also expects positive impacts for the company will be accompanied by positive impacts for the local community, including the need for additional qualified workers in a sector and for a group in which environmental sustainability is a fundamental asset. CAREL is one of the world leaders in control solutions for air-conditioning, refrigeration and heating, and systems for humidification and evaporative cooling. Our products are designed to bring energy savings and reduce the environmental impact of equipment and systems. Our solutions are used in commercial, industrial and residential applications. CAREL has 22 fully owned subsidiaries and seven production sites, as well as partners and distributors in a further 75 countries. For further information, visit www.carel.com.